New Vaio laptop over-eggs HD pudding? 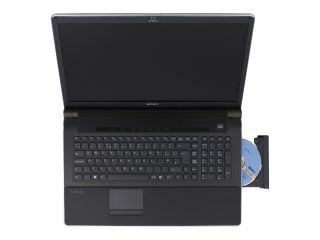 Sony has unveiled a new range of laptops that it hopes will show the world just how useful HD content and editing can be. A Vaio AW-series has a huge 18.4in display with full HD capability (1920 x 1080), backlit by a series of RGB LEDs, which can display 117 per cent of the NSTC standard (basically, very rich colours and lots of dynamic contrast). This backlighting method is the same seen on high-end Bravia TVs, so Sony is clearly packing it into this laptop. With a Blu-Ray disc drive as well, this is a TV designed for content as well as performance, with a built in subwoofer for proper Dolby 2.1 surround sound. Ooh. It also features an HDMI-out port in case you can't afford/ be bothered to buy a standalone Blu-Ray player. The specs are rather natty too, with a world's first 128GB SSD working in RAID array with a 500GB HDD, so large files can be easily read/written. There's also an Intel Core 2 Duo T9600 processor, and power 3D graphics from NVIDIA's 512MB GeForce 9600M GT, to complement the new disk set-up. And for those multi-monitor users, Sony has also released the VGP-UPR1 docking station, allowing users to connect extra screens through USB 2.0. Display link multi-monitor tech is used on the dock for easy window movement, and it features the usual host of connectivity, including Ethernet and four extra USB ports.